A Wabi Sabi Dog is any dog and every dog. It goes without saying that our veterinarian - and I can't say enough about Dr. Steve - and our exceptional groomers, Stephanie and Wraygan, were a big part of the dogs' lives and health. 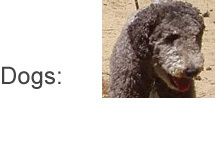 This site is a tribute to my dogs, standard poodles, Jesse and Nicholas and more recently, Bougie, a beautiful blonde Bouvier. 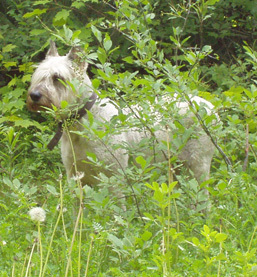 Jesse was my very first dog of my own – a near perfect girl. She came to me at twelve weeks old. She died September 2, 2010. I’m still grieving and I know I’ll miss her forever. Nicholas came second, a companion for Jesse. He was two. He’s a sweet old gentleman now. And Bougie, a Bouvier des Flandres, became part of the family in October, 2010. She wasn’t well and had multiple problems. She died in August, 2011, at the age of thirteen but we’d resolved her health issues and she had ten good months with us. We dearly miss this wonderful, sweet girl. The plan for this site is to help us all learn. I’m still so sad when I think of how some dog owners (and dog lovers) reprimand their pets for curling their lips when getting a tummy rub. They think a curled lip is a sign of aggression. Well, yes, but you must read the situation. It’s a sign of pleasure when their stomach is scratched. I remember how much pleasure Jesse got from a tummy rub and she showed it in her expression. I’d think up these scenarios wondering if someone else had owned her and punished her for that, she wouldn’t know what she did wrong. And that’s when I’d get sad.